11% of every dollar you spend at Joe’s Dining goes to this ground breaking project. Picture a pile of apple cores, chile skins, potato peelings and other food scraps as high as Mount Everest (29,000 feet). That’s how much waste Reunity Resources hopes to divert from the landfill during the first year of a new recycling program set to kick off in March. The organization plans to convert 2 million pounds of waste from restaurants, hotels and institutions into nutrient-rich compost. The Santa Fe nonprofit is using a crowd-source fundraising site, indiegogo.com, in an effort to raise the $143,000 it needs to get started. As of Wednesday, the group had raised $1,800 toward its goal. The campaign ends Jan. 22, 2014. If successful, the nonprofit will begin to coordinate logistics with restaurant, hotel and grocery store clients. Tejinder Ciano of Reunity Resources said the Santa Fe City Council approved a professional services agreement with the nonprofit in mid-November. But the city is not funding the program. Reunity Resources plans to lease 64-gallon carts from the city, and participating restaurants and hotel kitchens would use the carts to deposit pre- and post-consumer waste. Meat, bones and vegetables may be mixed together. Larger institutions could have up to a dozen carts and three collections per week. The simplest plan calls for one to three carts and one weekly pickup. Ciano said there’s a lot of interest, including from the Santa Fe Community Convention Center, but the first job is to raise the money. The community composting plan calls for spending of about $29,000 on equipment and materials, $98,000 in salaries (five new jobs), $6,000 for marketing and $9,500 for insurance. Once it is up and running, the business is designed to be self-sustaining from revenues generated by the fees. During the pilot phase of the program, which is set up to handle waste from about 30 restaurants, the fees will be $50 per pickup. Reunity Resources already is collecting grease from about 60 restaurants in Santa Fe and converting it to biodiesel fuel. Ultimately, it would like to do the same with kitchen scraps by making its own compost and donating it to schools and other nonprofits. 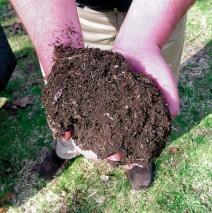 Meanwhile, the scraps will go to the Payne’s Organic Soil Yard, which will process them into compost for sale. According to Ciano, less than 30 percent of what ends up in landfills belongs there. Of the rest, a least a quarter is compostable, he said. Besides taking up room in the landfill, the organic matter also creates methane, a greenhouse gas that traps 21 times more heat than carbon dioxide, he said. To donate, investors can go to indiegogo.com and search for Moving Mountains. There, they will find the “perks” associated with various levels of contributions. For $20, for example, you receive free admission to the Spring Equinox Launch Party in March featuring DJ Bacon and a silent auction. For $250, you also get a bag of worm castings or a worm starter kit. For $2,500, you also will receive a handcrafted, ergonomic pitchfork designed and made locally by metal artist and gardener Steve Dulfer.